Each creation comes in its own beautiful Romeo J.® box. 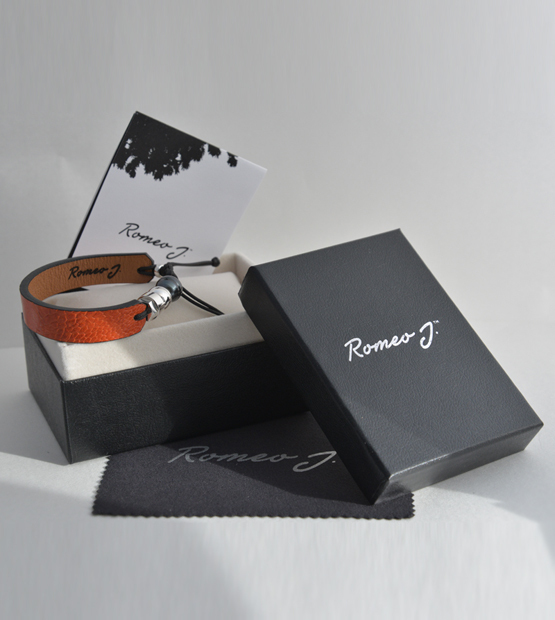 We also offer you a Romeo J.TMpolishing cloth, especially designed to make your bracelet shine and sparkle. Intended to change the landscape of traditional jewellery, Romeo J.TMpieces are designed to give the wearer a sense of confidence. Look, feel and texture are a large part of the motivation behind Romeo J.TMcreations. The collections use natural materials such as Tahitian pearls, precious metals and a variety of leathers and exotic skins in an array of colours, all of which evoke the artist’s East Asian heritage. Each bracelet has a custom-made 925-sterling-silver bead that bears the Romeo J.TM logo, lending a touch of authenticity and distinction. The pieces in these collections were designed to complement and enhance the style of men and women who are looking for a distinguished, authentic and relaxed look. We ensure that each piece in our collections meets the highest standards of quality and artistry to provide our customers with jewellery they will enjoy for many years to come. Proudly designed and handmade in Canada. The town of Sapa, the “queen of the mountains,” features rice terraces that cascade down the mountains like a patchwork quilt. This city is home to hill tribes whose colourful clothing was an inspiration for this collection. ENTER THE FASCINATING WORLD OF DIVERSE CULTURES AND MYTHIC LANDSCAPES. This bracelet collection reflects the multiple nuances of leathers and exotic skins, including cane toad, ostrich and tropical fish scales. Creations specifically designed for men and women looking for an original and refined piece of jewelry. These bracelets are set with a beautiful Tahitian pearl and, as each of our creations, a sterling silver bead that bears the RomeoJ.TM signature. Dàlat is the most popular place for honeymoons in Vietnam. With its spring weather, lakes, waterfalls, evergreen forests and luxurious gardens, Dàlat offers visitors a peaceful and tranquil place to relax. LIKE DÀLAT, THIS COLLECTION EMANATES SIMPLICITY, PURITY AND ELEGANCE. These hand-made bracelets are available in various classic, yet vibrant colors. Featuring a high-end genuine leather band, they are adorned with sterling silver components, including a bead engraved with our Romeo J.TM exclusive signature. This bracelet collection imparts the vitality and legendary energy of Sàigon. FASHIONABLE, REFINED AND LUXURIOUS, THIS BRACELET COLLECTION WILL MAKE YOU FEEL UNIQUE. Designed with the most prestigious materials, these simple yet elegant bracelets are sure to please men and women. Crocodile leather as well as python and stingray skins give them a chic look, while our best quality Tahitian pearls and authentic Romeo J.TMsterling silver bead are the perfect complements. The silver beads can be plated with yellow or pink 18 carat gold to provide uniqueness. Contact us or your nearest retailer for more information. A WORLD AWAITS YOU, EXPLORE IT! An Odyssey of modern times, this bracelet collection reflects the beauty of the world. Inspired by the uniqueness of the four corners of the earth, these creations echo the wonders of nature, cultural heritage and splendid landscaping. THE XPLOR BRACELET COLLECTION EMBODIES INGENUITY TO BECOME YOUR BEST TRAVEL COMPANION. Each leather band is designed with high-end robust leather and sports an X for Xplor, hand sown by our artisans. These timeless and versatile pieces of jewellery will be your companion throughout the day and all facets of your life, ideal for outdoor activities as well as festive evenings. Like a chameleon, the bracelets match your style, whether casual or dressy. Enter the world of Romeo and discover the unique jewels designed by Romeo according to his inspiration of the moment. 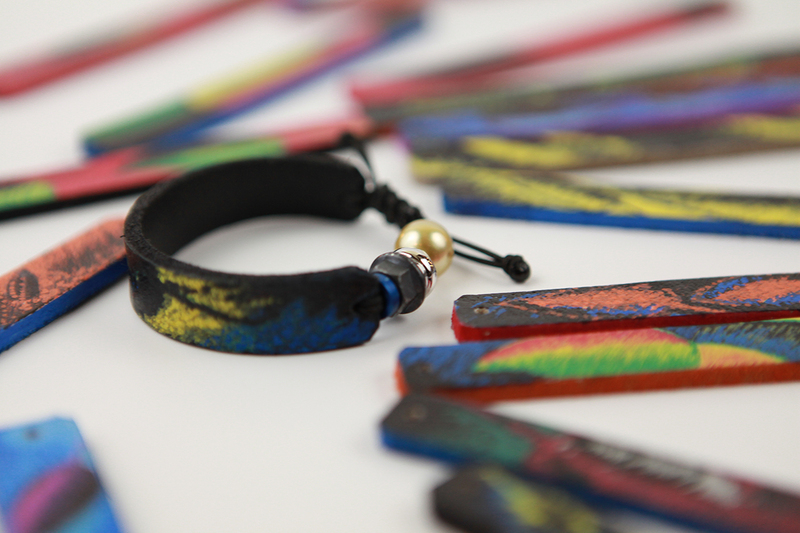 This collection includes hand-painted creations as well as limited edition jewellery.